By Scott Gilfoid: British and Commonwealth 175lb champion Callum Johnson has been picked out by the team of IBF light heavyweight champion Artur Beterbiev to face him later this year. The unbeaten Johnson (17-0, 12 KOs) says he’s not afraid of the unbeaten KO artist Beterbiev (12-0, 12 KOs), and that he believes he can beat. Johnson, 32, says he’s beaten Russian fighters before during his amateur career, so he thinks he’ll be able to do the same thing when he gets inside the ring with Beterbiev. You’ve got to give Johnson credit for taking the fight against Beterbiev, as no one seems to want to fight the 2-time Russian Olympian right now. Beterbiev is seemingly scaring everyone away despite the fact that his career has slowed since 2016 due to injury and promotional problems. When Beterbiev was active with his career, he was a real beast in knocking guys out left and right and looking sensational. Johnson is fighting Beterbiev at the best time right now. If Beterbiev is beatable, it’s right now due to promotional problems that has kept him out of the ring. 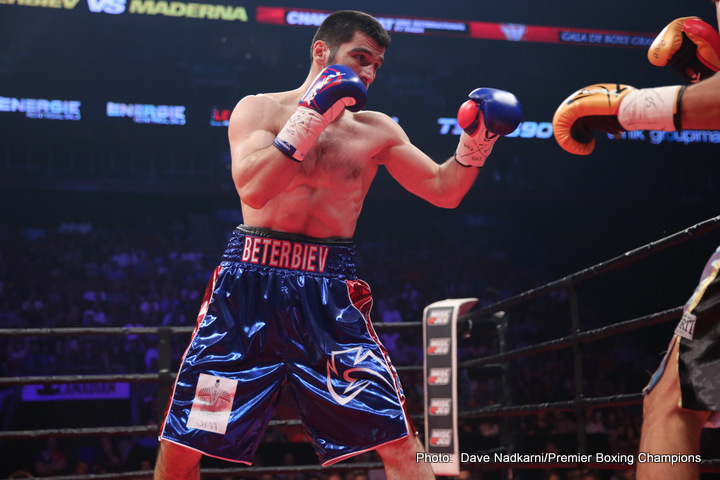 Negotiations for the Beterbiev vs. Johnson fight are said to be finalized for later this year. Johnson would like to get in a tune-up fight before he faces the 33-year-old Beterbiev, but it’s unclear whether he’ll be able to do that. Johnson’s problem is he’s only had one fight in the last two years, and that was against the hapless Frank Buglioni, who he stopped in the 1st round on March 24 at the O2 Arena in London, UK. Before that, Johnson knocked out Wilbeforce Shihepo, 35, by a 9th round knockout, Norbert Szekeres by a 1st round knockout and Richard Horton by a 1st round knockout. In total, Johnson has fought only 12 rounds in his last four fights since 2016. While it’s good that Johnson has been scoring a lot of early knockouts, it hasn’t helped him improve his stamina to any extent. If Johnson is forced to go more than 6 rounds against Beterbiev, he might fall apart straightaway and wind up getting knocked out. I’m just saying. It’s not such a brave thing that Johnson is doing in taking the fight with Beterbiev. I think it’s more of a desperation thing. Johnson is 32, which is not young for a contender, and he’s frittered away the last 8 years of his career fighting poor opposition. Those eight years flew by, and now Johnson is nearing his mid-30s, and he likely understands now he doesn’t have much time left in his career before it’s over with. If Johnson turned this fight down with Beterbiev, it could take another two or three years before he’s offered another title shot. Johnson would be at risk of aging out before he ever gets a title shot unless he’s one of those rare fighters that are able to fight until their 50 like Bernard Hopkins. The 2010 Commonwealth Games gold medalist Johnson blabbering about how brave he is won’t help him when he gets inside the ring with the monstrously powerful Beterbiev. Johnson is going to have to show some actual talent if he wants to win this fight, because it’s not going to work for him to bum rush Betrbiev in his usual primitive style of fighting hoping to bang him out of there in the 1st round on the night the way he did against Buglioni, Szekeres, Jose Manuel Iglesias, Josef Obeslo, and Tommy Tolan. The problem is Johnson has been fighting with his bum-rushing style for such a long time, I don’t think he can change how he fights even if he wants to. It’s not about Johnson not being afraid of Beterbiev. Those are empty words. There are plenty of foolhardy fighters, who step into it thinking they’re invincible. Doesn’t mean they’re great fighters that they don’t fear their superior opponents. It just shows that they’ve got a problem upstairs when it comes to recognizing threats. I mean, you’ve to be at least a little afraid when you’re fighting a guy with way more talent. This is a huge step up in class for Callum Johnson, who hasn’t been busy enough with his career to improve the way normal fighters do. I’m not sure what’s up with Johnson’s long stretches of inactivity, but it seems to suggest to me that boxing isn’t a priority for him right now at this point in his life. If you don’t live the life, then you go downhill. Right now, Johnson has been able to get away with his inactivity due to the soft opposition his promoter Eddie Hearn has been feeding him. Johnson hasn’t been fighting quality guys during his eight-year pro career, especially lately. By this point in his career, Johnson should have already fought for a world title two or three times. Johnson should have been fighting guys like Marcus Browne, Juergen Braehmer, Oleksandr Gvozdyk, Badou Jack, Joe Smith Jr., Andrzej Fonfara, Eleider Alvarez, Sergey Kovalev, Dmitry Bivol, Mike Lee, Dominic Boesel, Sullivan Barrera, Isaac Chilemba and Adonis Stevenson. “I’d like to get a fight in before but it all depends on how negotiations go, when it takes place and what my team think the best thing to do is,” Johnson said. Well, Johnson might not have time to get a tune-up fight in before he needs to fight Beterbiev. If anything, Johnson might end up shooting himself in the foot if he takes a tune-up fight right now, because if he gets nicked-up or hurt in some other way, then his title shot against Beterbiev will go down the drain. It just makes you wonder how badly Johnson wants to fight for a world title. If he really wants the shot, then he needs to start preparing for that fight, not for a tune-up level opponent. Johnson just won a domestic level fight against Buglioni, which is nice, but it wasn’t the type of opponent to get the boxing fans excited about Callum’s career. Fighting Beterbiev is a bigger deal for Johnson, and even if he loses, if he looks good in doing, his stock will increase. Johnson will get other important fights as long as he looks good in losing and shows courage. That means Johnson can’t run from Beterbiev, and he’s got to let his hands go from start to finish. The downside of the fight for Johnson is the money isn’t going to be that good due to the 33-year-old Beterbiev not being a big name. Johnson could take a lot of punishment from Beterbiev, and get beaten to a pulp. If Johnson beats Beterbiev, then his career will take off immediately and it’ll lead to him getting opportunities for unification fights against the likes of Sergey Kovalev and Dmitry Bivol. This isn’t the fight that Beterbiev needs to increase his popularity unfortunately. Johnson is not a household name, so Beterbiev won’t get much credit for beating the stuffing out of him. Beterbiev needs to be able to fight these guys for his career to take off: Dmitry Bivol, Badou Jack, Adonis Stevenson, Oleksandr Gvozdyk, Anthony Yarde, Marcus Browne and Sergey Kovlev.